It’s now been a couple months since the Spice Table stopped it’s lunch service. Finally, my tears have dried enough for me put thumb to phone to write out this eulogy to a fallen hero – Spice Table’s bahn mi lunch. Bryant Ng, the owner and chef at the Spice Table, has gathered accolades for his creative homage to the cuisines of Singapore and Vietnam. Ng was trained mostly under Nancy Silverton, most famously as the opening chef at Pizzeria Mozza. The technique and skill is obvious at dinner (which you can still enjoy six days a week) in dishes like the sublime Kaya toast, a perfectly soft-boiled egg broken onto thick cut toast with condensed milk and soy sauce. But lunch is our aim here. 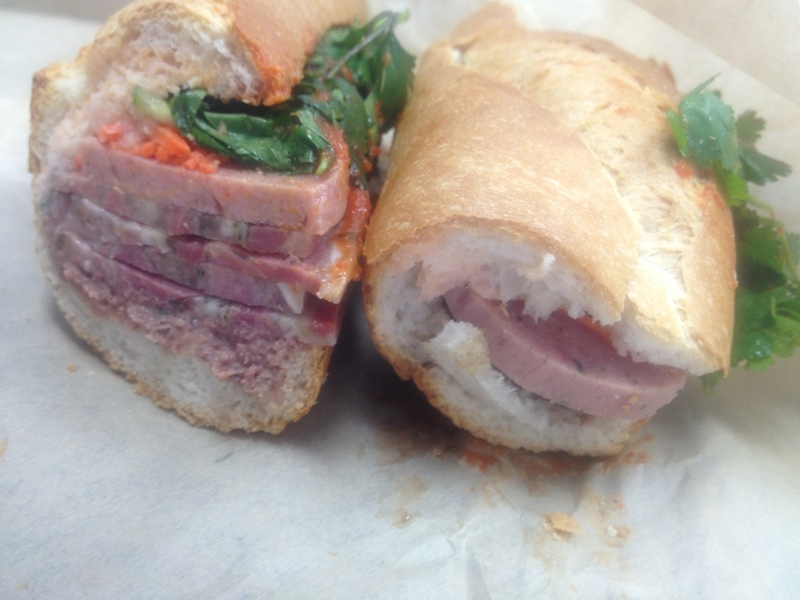 Here’s the house-made cold cut bahn mi. How can you justify $9 for a sandwich which is sold for $2-$3 a half mile away at Buu Dien in Chinatown? Uh, look at this thing. You’ve never ever had a bahn mi like this. The baguette is a perfect Parisian example, crisp on the outside, chewy and airy inside. Ng had a third-generation Vietnamese baker come in every morning to bake the baguettes for that day’s sandwiches. The bread ovens were apparently a casualty of the flood that killed lunch. *sigh*. Everything inside was housemade: the headcheese and pate and the pickled vegetables. 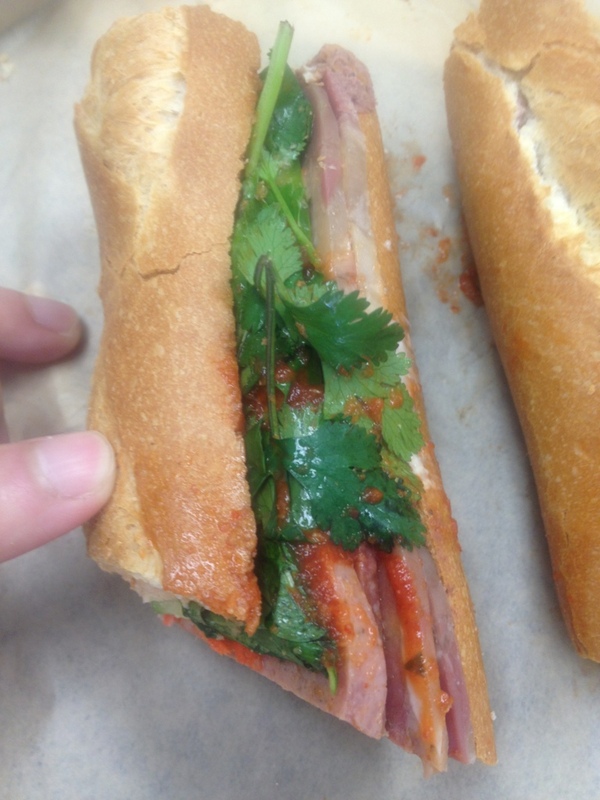 The sandwich was finished off with a squeeze of sriracha sauce and some cilantro. How can others sell a cold cut bahn mi for $3? It’s called store bought pate. Eeew. It had been made in some factory weeks ago and then shipped from Vietnam to sit in a grocery fridge case. Ng’s headcheese and pate are made in house from the bits and ends of real meat. The taste is incredibly funky and rich, but definitely fresh. I’m going to miss you, cold cut bahn mi. Lunch in Little Tokyo has grown dimmer. 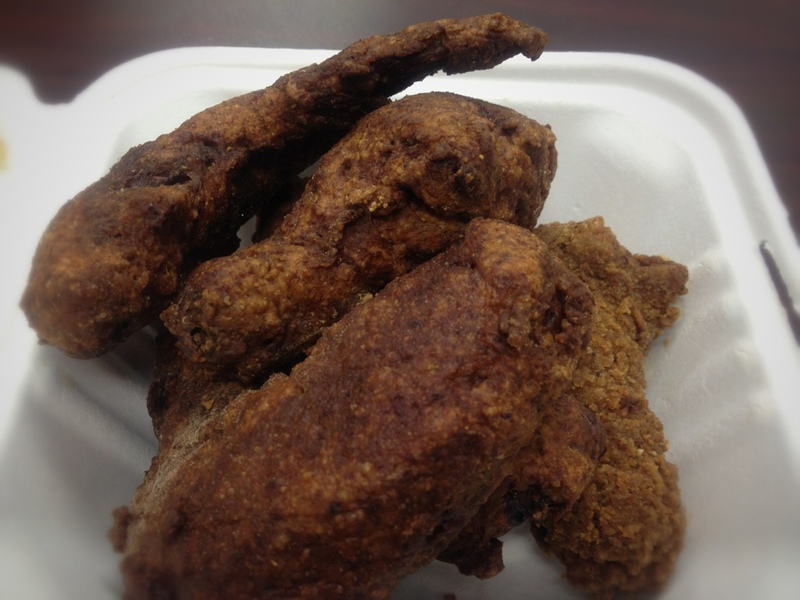 Here are the curry fried chicken wings. Ng is so skillful in his use of classic techniques to create Southeast Asian flavors. His use of spices is perfect, giving authentic flavors but not overdoing it. These wings are coated in panko breadcrumbs and rolled in curry and spices and fried to crispy moistness. 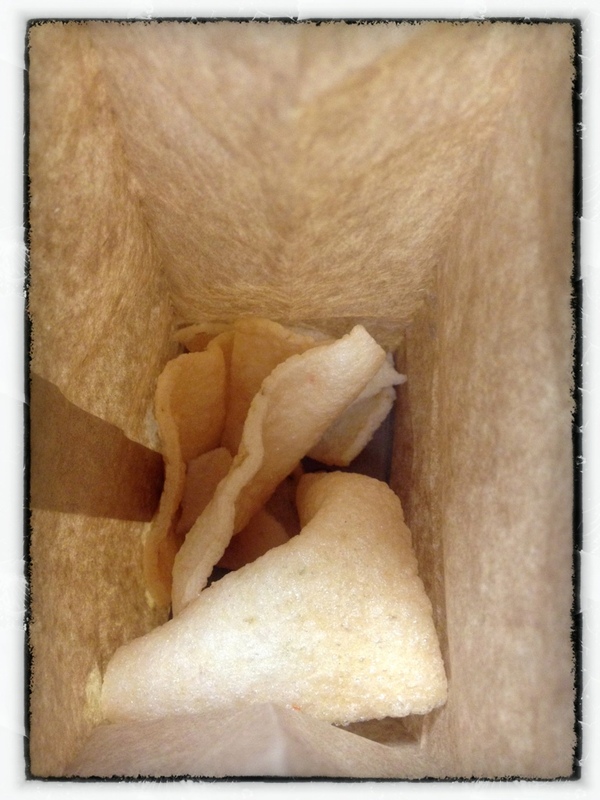 These are Ng’s shrimp chips. I don’t know if my friends liked these as much as I did. 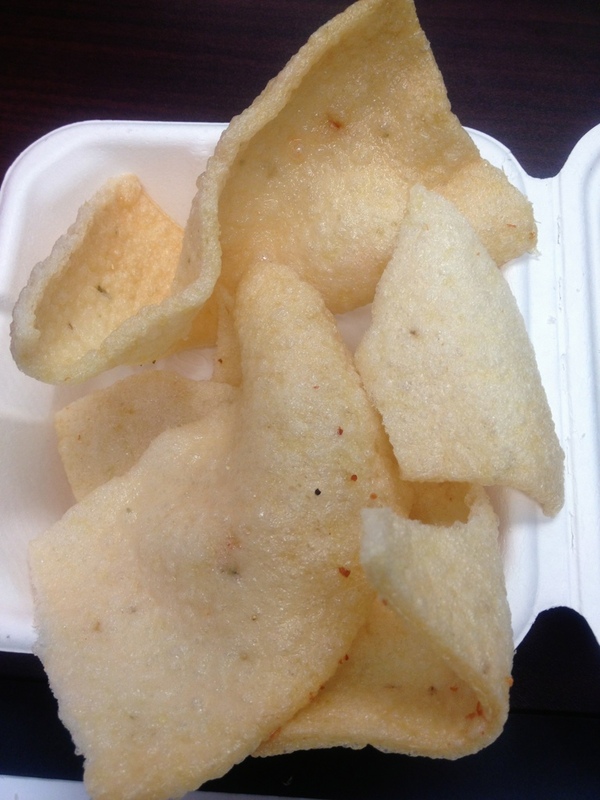 I had grown up eating tons of Asian market shrimp chips and loving them. I still buy them. But Ng’s version is, of course, made from scratch from rice flour and shrimp powder of some sort. They are delightfully crunchy and have a more intense shrimp flavor. It is completely evocative of the mass-market packaged variety and yet improves on it in every way. That was what the Spice Table was – a curated collection of Ng’s childhood flavors, carefully improved on from his years of training. Ng’s cheeseburger was intended to evoke In ‘n’ Out and Pasadena’s Pie and Burger, but he grinds and forms each party by hand and personally grills each one to order to a just above rare doneness. Ng topped the burger with a sambal sauce, which was not overpowering, but took the flavor of the burger to a unique and awesome place. And then topped it with a slice of Kraft American cheese, just to complete the homage. This was secretly one of the best burgers in a burger mad town, and he charged less than $8 for it at lunch. Incredible. On the side, you could order fries, which were not fried in some crazy way. They were just done really well, intended to evoke the best fries you ever happened to get at McDonalds. But Ng served the fries with a side of intense curry sauce, which transformed the fries into something unique and interesting. I hope lunch will rise from the ashes some day, as Ng is now saying that he will respawn the restaurant in a year or two. Until then, pour one out for the best lunch downtown now fallen.